Over the next few months, WEMU's environmental feature, 'The Green Room.' 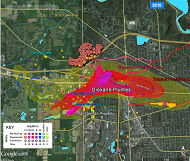 will focus exclusively on the 1,4 dioxane plume that is impacting groundwater in the Ann Arbor area. Following last week's initial report looking at how another major city is handling its dioxane issues, we take the next step in exploring whether solutions in Tuscon, Arizona might work here. The Green Room 04/01016: Barbara Lucas explores whether solutions to 1,4 dioxane contamination bing used elsewhere can work to solve the problem in the Ann Arbor area. David Fair (DF): Last week, in the first of what will be an ongoing series on Ann Arbor’s Dioxane contamination, WEMU looked at another city—Tucson, Arizona—which is removing dioxane in its drinking water to levels far below Michigan’s new Standard of 7.2 parts per billion. In this installment of “The Green Room,” Barbara Lucas explores the question: Could a similar treatment be used to clean up the groundwater here? Before it gets to our drinking water? Barbara Lucas (BL): Matt Naud’s the Environmental Coordinator for the City of Ann Arbor. Over coffee, we discuss the UV process used to treat drinking water in Tucson, to below .1 ppb. Without creating the cancer-causing by-product bromate. Naud says, prior to 2005, Pall was using UV as well. Pall’s the company responsible for cleaning up Ann Arbor’s plume. But they found it expensive. So they successfully petitioned the court to allow a less effective method. Matt Naud: Under state law Pall was able to change from using a treatment technology that was to one or two parts per billion (ppb) to one that is now six or eight ppb, AND adds bromate. BL: Naud’s not happy with the switch. He’s doesn’t like these high levels being discharged into Honey Creek. The creek drains to Barton Pond, the city’s drinking water supply. Naud: I think we ought to be pushing for best available technology. You know, minimizing… especially any of these discharges that are going upstream of a drinking water source. BL: He’s confident the city’s water supply is safe. He says the dioxane in Honey Creek is greatly diluted by the enormous Barton Pond. And he doesn’t believe the plume will ever reach the Pond. Naud: We test to 70 parts per trillion and aren't finding it in Barton. BL: He says in the highly unlikely event dioxane were to be found there, a plant would be built to treat it before it’s served to customers, like in Tucson. Naud: Let me be clear, if the city thought it were an emergency situation where we needed to do something, we would do it. BL: Could we go back to a stronger treatment process? Put to rest concerns about the city’s water supply, not to mention the hundreds of homes and businesses on well water, outside the city? I call Terry Keep, environmental contaminant treatment and sales manager at Trojan Technologies, which is treating the drinking water in Tucson. I ask if the same level of cleanup could work here, considering the extent of our plume. BL: Our concentrations are a lot higher than in Tucson, to get it down to Tucson’s levels which is below .1—do you feel your process could do that? Terry Keep: Yes. The concentration of the VOC is not what dictates whether we can do it or not because we can. What’s going to drive treatment is how much UV power to put in the water and how much oxidant, meaning hydrogen peroxide, do I need add to get to the amount of removal you need. BL: And what that comes down to is the money, right? Keep: Absolutely. Dollars and cents, that's not just for the capital cost but for the ongoing costs. BL: I ask what our project might cost compared to Tucson’s, which was between $16 and $20 million. Keep: Each project is unique and the uniqueness is driven by how much flow and concentration and water quality. So while you saw Tucson’s plant, they are treating it and drinking it directly, yours is more of a pump and treat and release—treating it to get rid of it, and putting it back in the ground. BL: He says treating at the plume is simpler than treating drinking water. BL: So our situation could potentially be cheaper than theirs? BL: He says although it might seem logical for liable polluters to go all out and nip it in the bud, at the cheaper plume stage, that rarely happens. (DF) Why not be pro-active? Follow the story in next Friday’s installment of “The Green Room,”—a presentation of the WEMU News Department, produced in partnership with the Office of the Washtenaw County Water Resources Commissioner. There will be a Town Hall Meeting with MDEQ Director Keith Creagh on Monday, April 18th at at Eberwhite Elementary, organized by State Representative Jeff Irwin.